It is a great pleasure for me to have the opportunity to join you, distinguished representatives of the Asia-Pacific business community, in this island paradise. Bali is not only a world-renowned tourist attraction, but also the birthplace of Bali Process and Bali Roadmap. And now, hosting the APEC Economic Leaders’ Meeting, Bali carries the expectations of the Asia Pacific and the rest of the world. The world economy is still struggling for recovery, and the Asia-Pacific economy, while enjoying a good momentum of growth, is confronted with new challenges. People around the world are looking to this year’s APEC meeting to give new impetus to regional and global economic growth. The world economy is still in the middle of profound readjustment. While there are signs of recovery, there are also problems of fragile foundation, inadequate momentum and uneven speed of growth. Major developed economies are far from resolving their structural problems, making it all the more necessary to strengthen macro-economic policy coordination. Emerging market economies have slowed down and now face more external risks and challenges. The Doha Round negotiations are fraught with difficulties, and trade and investment protectionism is resurfacing in new forms. To achieve a full recovery and healthy growth of the world economy will be a long and tortuous process. Confronted with the new challenges in the world economy, both developed and developing economies are looking for new drivers of growth. Where can we find the new drivers? In my opinion, they can only be found through reform, readjustment and innovation. The Asia Pacific has long been an important engine of world economic growth. To push for a recovery of the sluggish world economy, economies in the Asia Pacific should have the courage to do what has never been done before and build an open growth model featuring innovative development, interconnected growth and converging interests. Only by so doing can the Asia-Pacific economies, as one Chinese poem describes, “find the way to the next village shaded in soft willows and bright flowers despite the difficulties posed by mountains and rivers” and play a leading role in the recovery of the world economy. This is exactly what China is doing. China’s economy grew at a speed of 7.6% in the first half of this year. This is, indeed, somewhat lower than the previous growth rate of over 8%, which has caused some friends to worry about the prospects of the Chinese economy. Some wondered whether there would be a hard landing, whether sustained, healthy growth was still possible, how China would deal with this situation, and what impact this would have on the Asia Pacific. Here I wish to share with you some of my observations. To begin with, I want to emphasize that based on a comprehensive analysis of all factors, I am fully confident about the future of China’s economy. I am confident because first of all China’s growth rate is within the reasonable and expected range. From the previous double-digit growth rate to 9.3% in 2011, 7.8% last year and 7.6% in the first half of this year, the change in speed of growth has on the whole been smooth. In fact, the growth rate of 7.6% makes the Chinese economy the fastest growing among major economies. The fundamentals of the Chinese economy are good; GDP growth and other major economic indicators are within the expected range. So everything has been going as expected and nothing has come as a surprise. The slowdown of the Chinese economy is an intended result of our own regulatory initiatives. This is because to achieve the goal of doubling the 2010 GDP and per capita income by 2020, a 7% annual growth rate will suffice according to a thorough calculation done at the time we set our mid and long-term development goals. Moreover, we have recognized that to fundamentally ensure long-term economic development, China has to press ahead with structural reform, even if this requires some sacrifice of speed. In whatever undertaking, one has to look far and plan wisely to take care of both the short and long term needs. Killing the hen to get eggs or draining the pond to catch fish is no formula for sustainable development. Second, I am confident because the quality and efficiency of China’s economic development are improving steadily. China’s economic performance in the first half of this year has been generally smooth and made progress. By “smooth”, I mean our economic growth has been within a reasonable range, and by “progress” I mean the shift of our growth model has picked up pace. China is moving from over-reliance on investment and export in the past to increased dependence on domestic demand, especially on consumption. The economic figures for the first half of this year show an increasingly visible role of structural adjustment in boosting growth. Domestic demand has contributed 7.5 percentage points to the GDP growth, with 3.4 percentage points coming from consumption. We no longer take GDP growth rate as the sole criterion for success. Instead, we are focusing more on improving the quality and efficiency of growth. This has been proven a responsible approach for both China and the world. Third, I am confident because China has a strong home-grown driving force for growth. This force is growing and will continue to get stronger. The ongoing process of a new type of urbanization will create space for hundreds of millions of Chinese to move from villages to cities in pursuit of a better life. The improvement of education in China will bring about a new generation of modern, professional workforce of higher caliber, broader vision and better skills. China’s vigorous implementation of the innovation-driven development strategy will more closely link science and technology with economic growth, and foster innovation and emerging industries. The continued expansion of domestic demand and consumer market in China will unlock considerable potential for growth. And above all, China is committed to putting people first and making development benefits accessible to more people across the country. All these will translate into a strong home-grown force for the growth of the Chinese economy. Fourth, I am confident because the Asia Pacific enjoys sound development prospects. Thanks to the concerted efforts of all economies, the Asia Pacific boasts a high level of free movement of capital, information and people, an increasingly clear division of labor, and an emerging shape of a big Asia-Pacific market. The new scientific and industrial revolutions that are in the making will add to the existing strengths of this region. The Asia-Pacific economies are also in a much better position to fend off risks, with more flexible exchange rate regimes, notably larger foreign exchange reserves and various multilateral and bilateral financial arrangements providing institutional protection in the face of complicated situations. China has faith in the development prospects of the Asia Pacific. Benefiting from the overall economic growth in the region, China has achieved its own development. At the same time, China’s development has also contributed to regional economic growth. I believe that such interaction will gain even stronger momentum, thus creating more opportunities for the development of the whole region. I am deeply convinced that the Chinese economy will sustain its sound growth. At the same time, we are soberly aware of potential problems and challenges from falling demand, overcapacity, local debts and shadow banking, and we are paying close attention to possible impacts coming from the outside. In this connection, we are taking prudent and proper measures to forestall any potential problems. The Chinese economy has entered a new development stage. It is undergoing profound transformation of growth model and structural readjustment. In this process, there will inevitably come one challenge after another. Efforts to meet the challenges will be accompanied by throes of readjustment and growing pains, which will prove to be worthwhile. Rainbow often appears after wind and rain. As someone aptly puts it, “No mountain is too high for a man to scale and no road too long for a man to walk.” However high the mountain may be or daunting the obstacles may seem, we will be able to reach our goal as long as we stay the course and keep moving forward. If China is to make progress, it must deepen reform and opening-up in all respects. To live up to the new expectations of our people, we must, with firm confidence in reform and opening-up, greater political courage and wisdom, and stronger measures, advance reform and opening-up, further open our mind, unleash and develop social productivity, and unlock and enhance the creative forces of the society. China is drawing up a master plan for the deepening of reform in all respects. Our general approach is to press ahead with reforms in economic, political, cultural, social and ecological fields in a balanced manner, address the challenges cropping up in the course of development, remove institutional obstacles to sustained and healthy economic growth, and create new impetus to economic development through reform. We will improve our basic economic system, strengthen the building of market system, advance institutional reform in macro regulation, fiscal and tax systems, financial sectors and investment, deepen the market-oriented reform of interest rates and exchange rate, make the RMB exchange rate more flexible, and achieve, over time, the convertibility of the RMB under capital account. We will continue to reform the administration system, transform the functions of the government, streamline government and delegate powers in order to have a clearly-defined relationship between the government and the market and let the market play its basic role in allocating resources to a greater degree and in a wider scope. We will improve the management system of science and technology, enhance innovation capability, and build a system for technological innovation which is led by enterprises and guided by the market and which integrates the efforts of enterprises, universities and research institutes. We will ensure and improve people’s well-being on a priority basis, promote social equity and justice, achieve higher quality employment, deepen the reform of income distribution system and improve social security and basic public services. We will step up environmental protection and resources conservation to create a good working and living environment for our people and make new contribution to the global response to climate change. We will follow a more proactive opening-up strategy, improve the open economy which is mutually beneficial, diversified, balanced, secure and efficient, encourage coastal, inland and border areas to draw on each other’s strengths in opening-up, develop open areas that take the lead in global economic cooperation and competition, and form leading areas of opening-up that drive regional development. We will continue to attach equal importance to export and import, and promote balance in foreign trade. We will “bring in” foreign investment and encourage companies to “go global” at the same time, and enhance international investment cooperation. We will deepen investment- and trade-related institutional reforms, and improve relevant legislation to create a legal environment in which foreign companies in China can operate in a level playing field. We will make overall planning for bilateral, multilateral, regional and sub-regional opening-up and cooperation, accelerate the implementation of the FTA strategy, and promote connectivity with our neighboring countries. We are aware that the reform is a profound revolution that involves adjustment of major interests and improvement of systems and institutions in various fields. China’s reform has entered the deep water zone where tough challenges must be met. The problems we face in the current phase of reform are especially difficult. They are hard nuts to crack, so to speak. It is extremely important that we press ahead without ever letting up. If we hesitate and become indecisive, we will not be able to make breakthroughs and all our previous gains may be lost. China is a big country. We can not afford any drastic mistake on issues of fundamental importance, as damage from such mistakes will be beyond remedy. Our position is that we must be both bold enough to explore and make advances, and sufficiently prudent in carefully planning our action. We will stick to the right direction and press ahead with reform and opening-up. We will have the courage to crack the “hard nuts”, navigate the uncharted waters and take on deep-seated problems that have built up over the years. We must not stop, even for a while, in our pursuit of reform and opening-up. The Asia Pacific is a big family and China is a member of this family. China cannot develop in isolation from the Asia Pacific while the Asia Pacific cannot prosper without China. Sustained and healthy development of the Chinese economy will bring greater opportunities to the development of the region. China will firmly uphold regional peace and stability, and help cement the foundation for a win-win situation in the Asia Pacific. I want to repeat what I have said at the Boao Forum for Asia and other events this year, “Peace, like air and sunshine, is hardly noticed when people are benefiting from it. But none of us can live without it.” Without peace, development is out of the question, like water without source and a tree without roots. We the Chinese often say, “A family of harmony prospers.” As a member of the Asia-Pacific family, China is ready to live in amity with other family members and help each other. We hope that all members of the Asia-Pacific family will cherish the peace and stability we enjoy, which has not come easily, and work together for a harmonious Asia Pacific of enduring peace and common prosperity. China will work energetically to boost regional development and prosperity, and broaden opportunities for mutual benefit in the Asia Pacific. China is the biggest trading partner, largest export market and a major source of investment for many Asia-Pacific economies. In 2012, China accounted for more than 50% of Asia’s economic growth. By the end of the same year, China had approved more than 760,000 foreign invested businesses, and attracted around US$ 1.3 trillion of foreign direct investment. China has signed with 20 countries and regions 12 free trade agreements, with six more under negotiations. Most of China’s free trade partners are APEC members. In the coming five years, China will import over US$10 trillion of goods, invest over US$500 billion overseas, and send over 400 million tourists abroad. China’s growing domestic demand, particularly consumption and investment demand, will offer foreign investors more opportunities of cooperation. China will commit itself to building a cross-Pacific regional cooperation framework that benefits all parties. The vast Pacific is free of natural barriers, and we should not erect any man-made ones. We should let APEC lead and coordinate our actions, and uphold the approach of openness, inclusiveness and mutual benefit. We should enhance coordination on macro-economic policies and among regional free trade arrangements, deepen regional integration, and avoid the Spaghetti Bowl effect, so as to build closer partnership across the Pacific and jointly pursue long-term development of the Asia Pacific. “Boundless is the ocean where we sail with the wind.” Like a vast ocean, the Asia Pacific offers enough sailing space for us to make progress together. Each and every APEC member has a stake in the future development of the Asia Pacific. 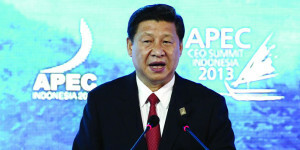 China has high hopes for this year’s APEC Economic Leaders’ Meeting. We stand ready to work with our partners in this region to build a beautiful Asia Pacific that leads the world, benefits all sides, and ensures the well-being of future generations. With this in mind, I would like to share with you my vision about the Asia-Pacific region in four aspects. First, an Asia-Pacific region that seeks common development. The Asia-Pacific economies have close ties and shared interests. We should draw upon our respective strengths, optimize the allocation of economic resources, improve industrial layout, and build an Asia-Pacific value chain and a big Asia-Pacific market where benefits are shared by all. The developed economies should provide stronger support and assistance to the developing ones, while the latter should for their part work hard to catch up. Only by narrowing the development gap can we all rise with the tide of development in the Asia Pacific. Second, an Asia-Pacific region that stays committed to open development. The end of World War II was followed by an economic boom of more than 25 years in 13 economies in the world. One common feature of the economies was their policy of opening-up. We should follow the trend of the times, uphold a multilateral trading system that is free, open and non-discriminatory, and oppose all forms of protectionism. We should work together in building open economy and a framework for regional cooperation, and, in an open and inclusive spirit, advance the building of a free trade area of the Asia Pacific. Third, an Asia-Pacific region that promotes innovation-driven development. Growth will be unsustainable if it is solely driven by fiscal stimulus measures and unconventional monetary policies, and will be too costly if it is based on excessive consumption of resources and achieved at the expense of the environment. We need innovation in both the thinking and approaches of development. We should abandon outdated mindsets, break away from old confines, and pursue green, circular and low-carbon development. We should continue to improve our capability in innovation so as to foster emerging industries, explore new driving force for growth and enhance core competitiveness. Fourth, an Asia-Pacific region that pursues interconnected growth. The Asia-Pacific economies are interdependent on each other, with shared interests and common destiny. The success or failure of one may ultimately lead to success or failure of all. In this chain of dynamic interactions, one economy’s development will have a knock-on effect on other economies. We should strengthen the sense of community of common destiny, contribute to other’s development with that of one’s own, tap fully into our respective strengths through coordination and interconnection, pass on positive energy and achieve sound interactions and coordinated development among all economies. At present, Asian countries, especially emerging markets and developing countries, are in great financial needs to develop infrastructure. Particularly in the face of such severe challenges as mounting downward pressure and financial volatility, it is necessary for us to mobilize more funds for infrastructural development to maintain sustained and steady economic growth and promote connectivity and economic integration in the region. To this end, we propose to establish an Asian infrastructure investment bank to help fund the infrastructural development of ASEAN countries and other developing countries in the region. This proposed bank will work together with the existing multilateral development banks in and outside the region and complement one another to fuel the sustained and steady growth of the Asian economy. The business community is a major force for the development of economy and trade as well as an integral part in APEC cooperation. China places great importance on the role of the business community. We are ready to hear your views and suggestions and facilitate your deeper and easier engagement, especially that of SMEs and micro businesses, in economic development and regional cooperation. Last August, China’s business community established an APEC China Business Council. This provides institutional guarantee for the business sector’s deeper involvement in the making of economic and trade rules in the Asia Pacific, and demonstrates the readiness of China’s business community to undertake international responsibilities. More friends, more opportunities. Many of you present here are old friends of the Chinese people who have participated in China’s reform and opening-up endeavor. We will never forget old friends, and we will be most happy to make new ones. China welcomes and encourages businesses from all economies, APEC members in particular, to invest and do business in China and take an active part in China’s reform and opening-up endeavor. The more friends we have, the more China’s reform and opening-up endeavor will thrive and prosper. I hope friends from the business community will make full use of APEC as a platform to get your voices heard on how to improve trade and investment environment in the Asia Pacific, and, with your strength in market information, technology incubation, and innovative capability, put forward strategic and forward-looking suggestions so as to contribute your ideas to promoting trade and investment liberalization and facilitation, deepening regional economic integration and the future development of APEC. China will host the 2014 APEC Economic Leaders’ Meeting and the related events. We will, taking this opportunity and focusing on the future of APEC, seek to build closer partnerships, deepen pragmatic cooperation, and enhance the leading role of APEC in shaping the long-term development vision of the Asia-Pacific region. I hope that all of you, friends from the Asia-Pacific business community, will meet in Beijing then for discussions and witness another important moment in the development of the Asia Pacific.